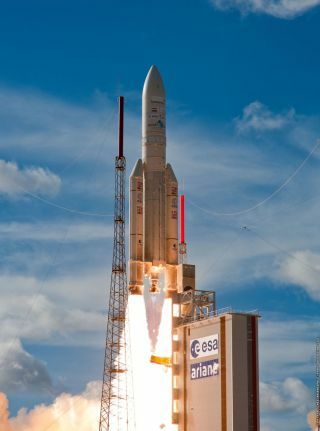 PARIS — A European Ariane 5 ECA rocket on July 25 successfully launched Europe's largest-ever telecommunications satellite and a meteorological spacecraft for India in the rocket's 56th consecutive success. Both satellites' owners said their satellites were healthy in orbit and sending signals. The launch was the third of a planned five this year for the heavy-lift Ariane 5 ECA, which launches from Europe's Guiana Space Center on the northeast coast of South America. The 6,650-kilogram I-4A F4, with 12 kilowatts of end-of-life power, will operate a contracted 15 years from 25 degrees east to expand the amount of L-band spectrum Inmarsat has at its disposal with its existing fleet. The Alphasat satellite also carries four technology demonstration payloads for the 20-nation European Space Agency (ESA), which along with the French space agency, CNES, financed Alphasat's development by manufacturers Astrium Satellites and Thales Alenia Space. Inmarsat has agreed to leave I-4A F4 at 25 degrees east for at least three years to permit ESA to complete demonstrations of the technology payloads, which include a laser communications terminal designed as a precursor for a commercial global data-relay system. Riding in the lower position on the Ariane 5 ECA was India's Insat-3D meteorological satellite. India's space agency, the Indian Space Research Organisation(ISRO), has a mandate extending far beyond research and development to include a prime contractor's role in India's meteorological, telecommunications and Earth observation satellites. The Insat-3D launched aboard the Ariane 5 ECA weighed 2,120 kilograms at launch and is designed to operate for seven years from 82 degrees east in geostationary orbit. The satellite carries a six-channel imager and a 19-channel sounder instrument, with the latter designed to take vertical profiles of atmospheric humidity, temperature and ozone levels. Insat-3D also carries a search-and-rescue transponder to relay distress signals from maritime, aeronautical and terrestrial beacons to alert rescue centers. Insat-3D uses ISRO's veteran I-2K satellite skeletal structure, or bus, which is the same one used on many Indian telecommunications satellites. India is developing its own rocket to carry satellites to geostationary orbit, the destination of most telecommunications spacecraft as well as some weather satellites. But until the new GSLV, or geostationary satellite launch vehicle, is qualified for flight India continues to be a regular customer of the Arianespace commercial launch consortium of Evry, France, which operates Ariane 5. Arianespacesaid its next Ariane 5 flight, scheduled for Aug. 29, will carry ISRO's GSAT-7, a UHF-, S-, C- and Ku-band telecommunications spacecraft to operate from 74 degrees east in geostationary orbit. GSAT-7 also uses the I-2K bus. Riding in the Ariane 5 ECA upper position for the August flight will be the Eutelsat 25B Es'hail-1 satellite for Paris-based Eutelsat and Es'hailSat, the Qatar Satellite Co., to operate from 25.5 degrees east.